This is a full-size single urn and is designed to hold the cremains of a person having a total body weight of up to 228 pounds prior to cremation. The Eternal Ring Black-Gold brass cremation urn is crafted in the shape of a classic style vase with an engraved, enamel finish. It has a threaded, top-opening lid. Brass is one of the most popular and common materials used to create cremation urns today, and with good reason. Brass is an alloy of copper and zinc, and history tells us both the Ancient Greeks and Romans had an early appreciation of this beautiful, yet cost-effective and extremely useful metal. Brass cremation urns provide a simple and dignified resting place, while helping to ensure the memorial is as unique as the person being remembered. Brass urns can be kept at home, entombed in a cemetery columbarium niche or buried in an earth grave. 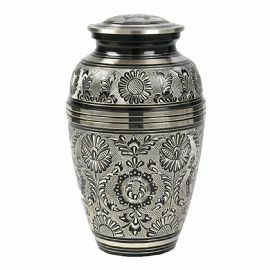 Please note some cemetery regulations may require that this urn be placed inside of an urn vault prior to earth burial.